I design websites for a living (when I'm not writing for this blog) and I can tell you one thing with perfect confidence: Adobe software is excellent, easy to use, intuitive and gives me the best results. And it's also super-pricey. Super-duper pricey. 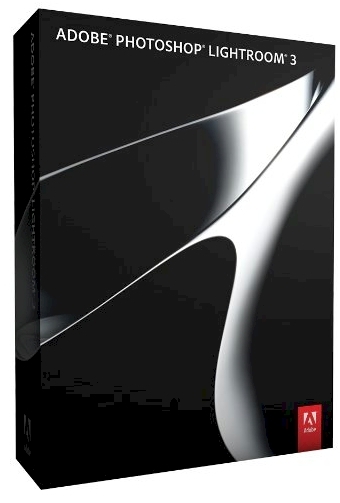 This one-day Amazon Gold Box Deal on Adobe Photoshop Lightbox 3 is a major steal. Dirt. Cheap. It's $89.99 with free shipping for today, 2/29/12 only, or until it sells out. My guess is it will sell out. This is the full-version software, not a watered-down educational package, good for PC or Mac, on operating systems Windows 7, Vista XP or Mac OS X. 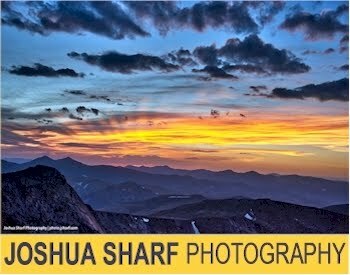 This software will help bring out the best in your photography. If you're doing any sort of desktop publishing involving photos, get it. It received a 4 1/2 star rating out of 5 over 157 customer reveiws. Get it today for only for $89.99 with free shipping, here. 12 oz. box of quinoa for....how much? 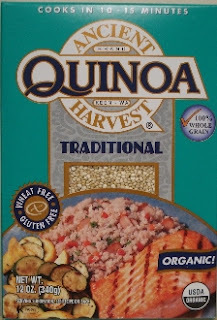 Wow, that is one expensive box of quinoa. I'd love to know if anyone actually bought this. I have a few $85 tubes of Colgate they might like. The Amazon Mom program has been closed to new members for a while, but it's open again. You get three months of free Amazon Prime shipping, but unlike the old program, you can no longer earn extra months of free Prime shipping for purchasing baby items. You still get an additional 20% total discount on diapers and wipes, so if you're a Mom or Dad of a young baby, this free program still hold value. 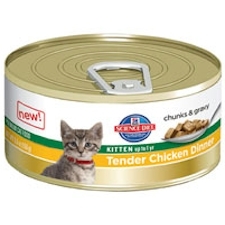 Print your coupon for a free can of Hills Tender Dinners cat food at Petco. 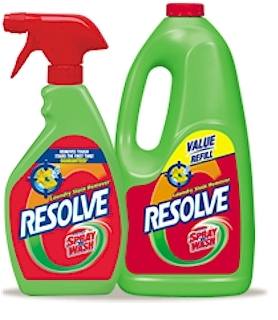 Value up to $1.20; expires 4/30/12. 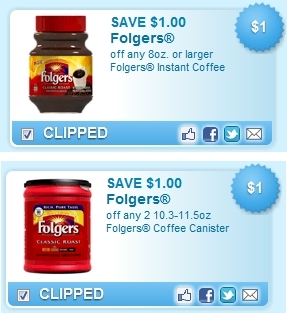 Print your $1 off Folgers 8 oz. instant coffee coupon here. Use zip code 99218 and click on the "Beverages" tab. You can also print a coupon for $1/2 10.3-11.5 oz. Folgers coffee canister. Remember, the only two instant coffee brands that have consistently been kosher for Passover over the years have been Folgers and Taster's Choice. So if you are planning on buying instant coffee this Passover, clip this coupon now. 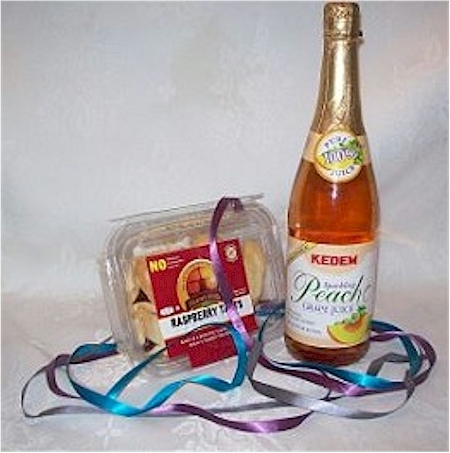 Passover, aka Pesach is has so much potential for budget-blowing, expensive, money-wasting behavior. And so I'm trying something new. Whenever I post something that is related to saving money for Pesach, I'm going to label it with my new "Pesach Deal Alert" badge. I'm hoping it will help point you, DailyCheapskate readers, in the right direction if you are looking for Pesach money-saving ideas. Click on it to see all the DailyCheapskate Pesach Deals in one spot. New Buy.com customers, get $10 off your $50 purchase at Buy.com, through Wednesday 2/29/12. $50 purchase does not include shipping and sales tax. This coupon is not valid with other promotions, including the Buy.com Deal of the Day. 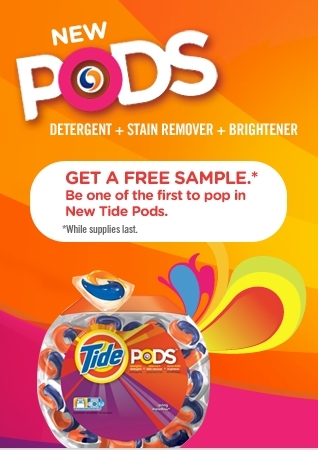 Get a free sample of Tide Pods here. This is a different link...not the same as this one. Who says they can never find coupons on produce? Print your coupon for $1 off a 59 oz. carton of Florida grapefruit juice or a 3 lb. bag of Florida grapefruit. Coupon is good through 5/15/12, so guess who will be buying grapefruit for Passover breakfasts? This one is going in the same folder as the Klondike BOGO coupon. This coupon is also save-able to your computer. When you save it, put the expiration date in the filename so you'll know when to delete it. Even with the extra day, February came and went much too quickly. Here's your reminder that the end of the month is nigh upon us; tomorrow is February 27, which means we can look forward to some new coupons popping up in the changing of the (coupon) guard. 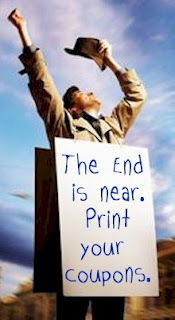 It also means that many of your favorite coupons, you know, the ones you've been meaning to print but haven't gotten round to, are going byebye. If you've got any coupons on Coupons.com, SmartSource, Red Plum, Whole Foods, Target, Betty Crocker, or Cellfire that you've been eyeing, now is a good time to put toner in the printer. Make sure to do your end of month coupon purge in your folders. This was definitely THE month to get cheap cereal. I was swimming in all sorts of cereal coupons. Why do those always come out so close to Passover? 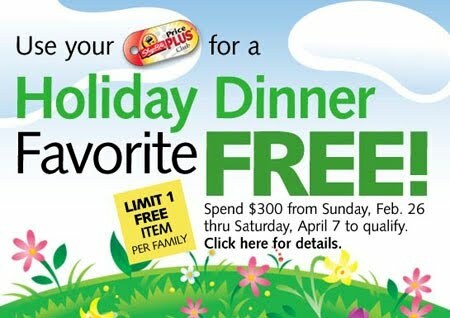 Speaking of Passover, now is the time to start eyeing your coupons for potential Passover value, i.e. that Klondike potatoes coupon, sugar coupons, egg coupons, Tropicana orange juice coupons, etc. Qualifying purchases toward the $300 are calculated before taxes, bottle deposits, and the face value of manufacturer coupons and after ShopRite store coupons, ShopRite Price Plus club deductions and any doubled or tripled value of manufacturer coupons. Program excludes prescription medications, gift certificates, gift cards, postage stamp sales, money orders, money transfers, lottery tickets, bus ticket sales, fuel and Metro passes, as well as milk, cigarettes, tobacco products and alcoholic beverages or any other items prohibited by law. 1SaleADay is having a Flash Sale on their Sleep & Play collection for kids. 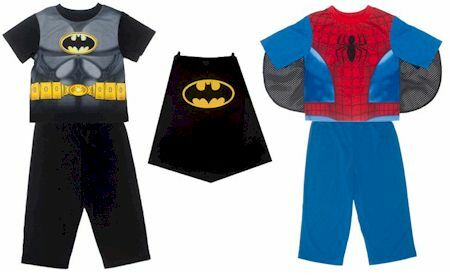 Included in the sale are these machine-washable Batman and Spiderman boys pajamas, in sizes 2T-5T, for just $9.99 each with free shipping. The Batman pajamas even come with a cape. These are too cute. This Flash Sale will go on until midnight EST today (2/26/12) so if you'd like these, get them now. Get the Smart Bin three-compartment trash can in stainless steel is on clearance at Walmart for $34! That's even less than some plain old one-compartment stainless steel trash cans cost. Free ship-to-store (find a Walmart store here) or $3.97 shipping to your home. 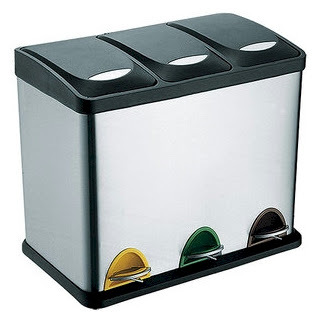 This is a great way to easily separate your recycling and/or composting trash from your regular garbage. Get this Mia Moda Veloce stroller for just $60.58 on Amazon, with free shipping. Sears has got the identical stroller for $129.99 and Walmart has it for $118.99, so this is basically a half-price deal. 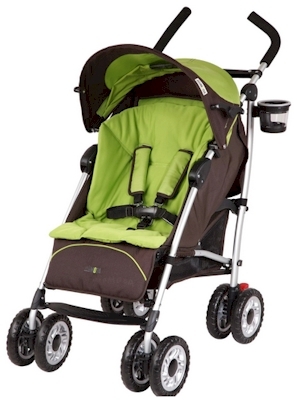 Get the Mia Moda Veloce stroller for $60.58 with free shipping here. These Martha Stewart Living Fabric cubes are heavily discounted down to $7, and then another 10% down to $6.30, and when you enter promo code 7096025A, the price will drop another 20% to $5.04, on HomeDecorators.com. Shipping is free. 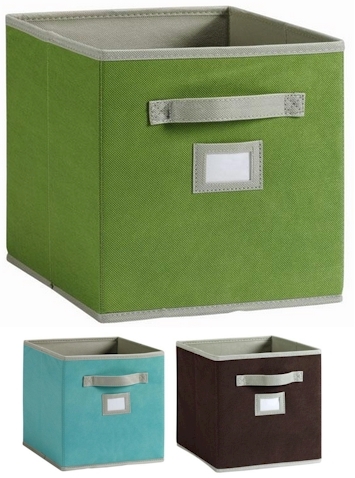 These fabric drawer/cubes are fantastic for getting organized. They are 11" H x 10.75" W and will fit on your bookshelf. I love these cubes and the color selection is awesome. Get them here. Lord of the Rings fans, hearken. (That's right, hearken.) 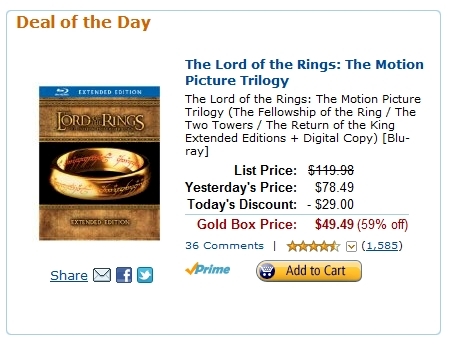 Today only, 2/26/12, Amazon's Gold Box Deal of the Day is the LOTR Blu-Ray set for just $49.49 with free shipping. The DVD sets go for $63.63. These sets are the special edition versions with all that extra magical stuff in them. 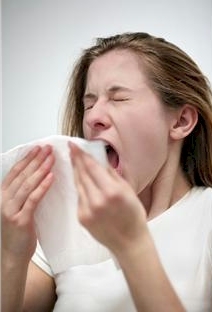 Print a $2 off one Zarbee's Cough and Sleep Syrup here. 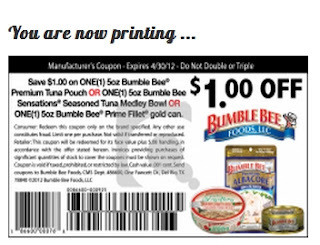 Bumble Bee has got a rare coupon out for $1 off either a) a 5 oz. pouch b) a Bumble Bee Sensations Seasoned Tuna Medley 5 oz. bowl or c) a Bumble Bee Prime Fillet 5 oz. can. They are using a pretty unconventional, hinky coupon printer for this, and you will only be able to print this once per computer. There are only 20,000 of these available so go there now: Click on the Bumble Bee Facebook page and like them. Then click on the "Coupons" tab and follow directions to print your coupon. 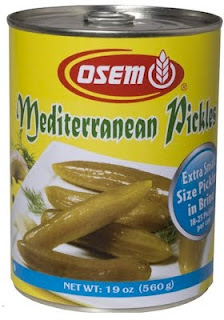 Osem Mediterranean Pickles (medium), 19 oz. cans, pack of 12, $16.47 ($1.38 per can). You will see $19.38 as the price listed, but ignore that. Select the Subscribe & Save option to snag the $16.47 price. Remember to unsubscribe from Subscribe & Save after your order ships, very easily done by going to your Amazon account settings. You can split up the 12 cans with friends or not...I bought this just for us, because we buy these delicious Israeli pickles year-round and I don't mind stockpiling them at this price. 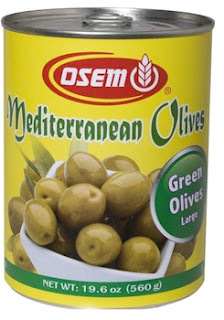 Osem Mediterranean Green Olives, 19.6 oz.cans, pack of 12, $31.38 $26.67 ($2.62 $2.23 per can). UPDATE: there is now a Subscribe & Save option for this item, dropping the price by 15%. Make sure you unsubscribe from this after your item ships. Not a supercheap deal, but still way less expensive than the store, which stocks them for $3.50 even when it's not Passover. 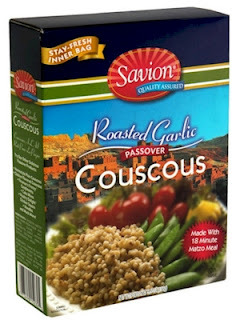 Savion Roasted Garlic Flavor Couscous made with 18-minute matzoh, 5.50 oz., pack of 6, $22.14 ($3.69 per box). Funny story about this product: I first had it when I was a Pesach guest at a new friend's home in Oceanside. I didn't know her very well (I have since gotten to be very close friends with her and her family), and the couscous that she served was so outstanding, I almost thought she had accidentally served chametz. This stuff is made with 18-minute matzoh meal and is so good, it's worth twice this price. I've seen it in the stores for $4.50+. Gefen KLP Onion Powder, 2.25 oz., pack of 8, $12.80 or $1.60 each. Pesach spices generally go for $2 each in most stores. Since no one uses 8 jars of onion powder in 8 days (unless you know something I don't), you will definitely want to split this one with friends, unless you decide to stockpile it for future years. Finally, here are the four items from my previous early-bird Pesach post that are still not sold out yet. Gefen Passover Tuna, Solid White, 6 oz. cans, pack of 8, $20.72 ($2.59 per can). Even though this price is still way better than what we've got in our local supermarket or other online grocers, I refuse to buy tuna on Pesach. Instead, we eat fresh trout or salmon. But if you've got to have tuna, this is a decent price for Passover cans. I might cave this year because we're planning a lot of Chol HaMoed daytrips and tuna is so easy to bring along. Paskesz Passover Barbecue Diddles Potato Snacks, Family Pack, 3.5 oz., pack of 6, $10.86 ($1.81 per bag). For the kids. Or at least, you can tell yourself that. UPDATE: Sold out. Mishpacha Passover Vinegar, 32 oz., pack of 9, $19.15 $16.59 ($2.13 $1.84 per bottle). UPDATE: Price is now $16.59. This is defintely an item you're going to want to split with friends, but at this price, they'll be happy to do it. Way healthier and cheaper to buy this and extra virgin olive oil from Costco and skip the overpriced Pesach salad dressings. Purim is now barely two weeks away...have you figured out what you're doing for Shalach Manos (aka Mishloach Manot or Purim Goody Baskets) yet? What am I sending my growing list of friends who have food sensitivities (like being gluten-free)? It's not easy to find food products that are both food-allergy-sensitive AND strictly kosher that don't also cost a small fortune. I found a company called AllergyFreeKosher, which is the only website selling allergy-free products that guarantees everything it sells to be kosher. Besides having a really nice variety of kosher gluten-free and allergy-free foods, they have a wonderful, very moderately priced selection of six Shalach Manos packages here. All of their Shalach Manos packages (which start at $29.99) are dairy-free, nut-free and gluten-free AND they ship for free. Even though the prices at AllergyFreeKosher are already very competitive, DailyCheapskate readers can get an additional 10% off any order when you purchase through this site and use promo code DAILYCHEAPSKATE at checkout. This promo code is good through 3/7/12. This is the budget "Traditional" package, $29.99 shipped or just $26.99 with promo code. 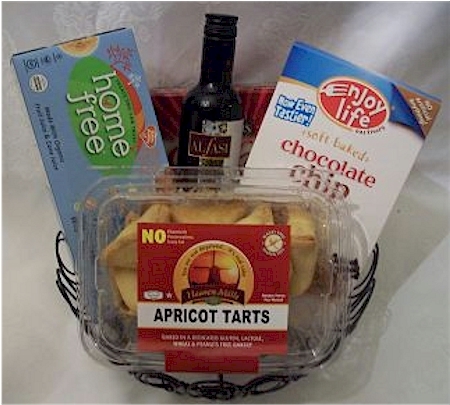 "A Healthy But Yummy Purim" at $34.95 shipped, or just $31.46 with promo code. "Cookies & Goodies" $49.99 shipped or just $44.99 with promo code. 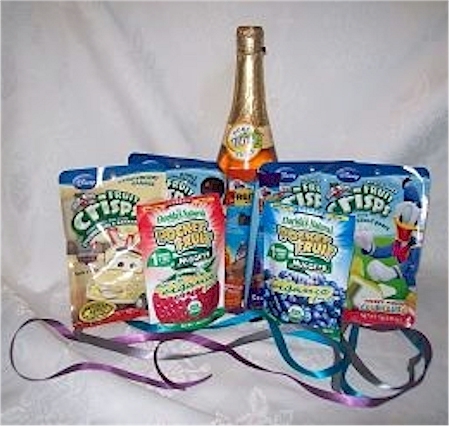 "The Snack Bar Tower," $54.99 shipped or just $49.49 with promo code. 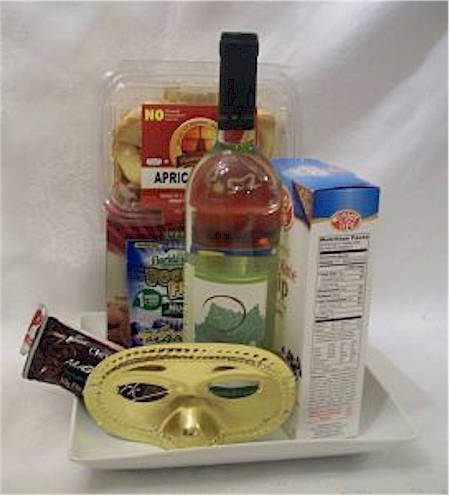 "Purim Plate Extravaganza," $59.99 shipped or just $53.99 with promo code. 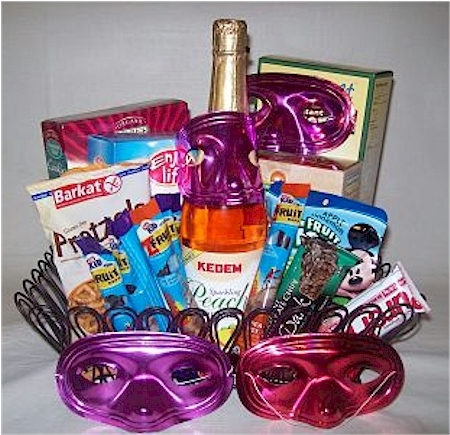 "Purim Galore," $74.99 shipped or just $67.49 with promo code. Bob's Red Mill Almond Meal/Flour, 16oz., $8.99 or $8.09 with the promo code. Compare this to $18.65 for the identical product on Amazon. Walden Farms Calorie-Free Strawberry Fruit Spread, 12 oz., $3.99 or $3.59 with the promo code. Compare this to $8.29 for the identical product on Amazon. Better Batter Gluten Free Flour, 20 oz., $5.69 or $5.12 with the promo code Compare this to $6.13 for the identical product on Amazon. For information on the high kashrus standards of AllergyFreeKosher, please read more about it here. 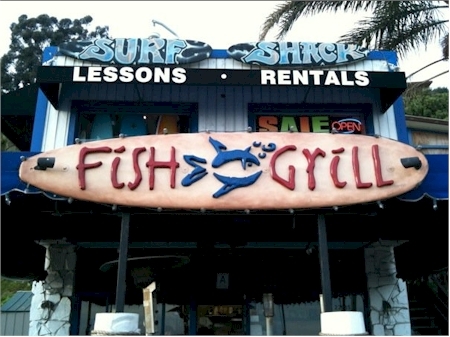 Groupon for $10 for $20 on the Fish Grill in L.A.
Ok, I'm absolutely sick over this. What? Why? The Fish Grill in Los Angeles is absolutely my favoritest kosher restaurant ever. I would eat breakfast, lunch, and dinner there if I could. The fish is grilled and served up with salad and it tastes amazing. I'm sick over the fact that I have no plans to be in L.A. in the coming months to take advantage of this half-price Groupon. Grrrrr. My BFF Ariela lives out in L.A., and I'm thinking now that I'm long overdue for a visit. Isn't that crazy? That's how much I love the delicious food at the Fish Grill. I really, really want this Groupon. 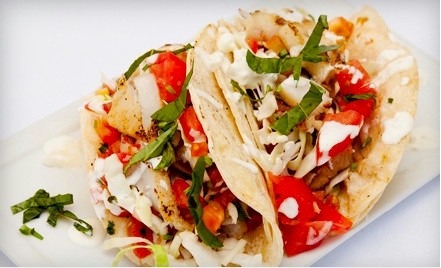 Groupon has got a $20 Fish Grill voucher for $10, good at the Malibu Fish Grill and the one on Wilshire. (Oh, how I love the Malibu one! It's right on the beach, and everything tastes better on the beach. The picture above is one I took the last time I was out in Cali.) The Groupon voucher expires on 6/27/12, and is not good from 3/31/12-4/15/12 (Passover). Limit one per customer. Los Angeles DailyCheapskate readers, if you like fish and healthy eating (and especially if you keep kosher), buy this Groupon. That's all I'm saying. That, and I'm so jealous. It will be available through tomorrow and then it goes away. 1SaleADay is having a Flash Sale on Pearls! Freshwater pearls, shell pearls, I lovelovelove pearls. Most of the jewelry items are set in sterling silver. The necklace/bracelet/earrings set shown above is made up of genuine 5.5-6mm freshwater pearls and is just $9.99 with free shipping! As a matter of fact, everything on the flash sale has free shipping! But it ends at midnight EST, less than two hours away. 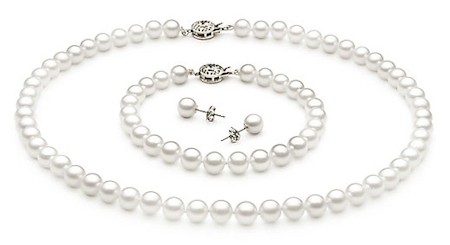 Click here to snag your gorgeous pearl jewelry for an incredible price. 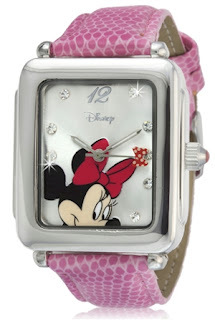 Hurry, less than two hours left to get this genuine Disney Minnie Mouse quartz watch from 1SaleADay Watch for $14.98 shipped. These watches become collectors' items. This sale disappears at midnight EST, so if you want it, buy it now. Remember, once you tap "Use" on your Shopkick coupon, you have only 12 hours to use the coupon or it will expire, so don't tap them until you are on line at the store. Today only, you will get 200 Kickbucks for each walk-in. Considering the fact that gift card rewards start at 500 Kicks, that is one pretty sweet deal. Now, here's an even faster way to get Shopkick on your phone, and get a 50 kicks bonus to boot. Click here through my special link (and thanks for letting me refer you), and fill out the short form (you can connect via email or Facebook). Shopkick will text the link to their app directly to your smartphone. Just click on the link in the text and it will download and install on your phone. 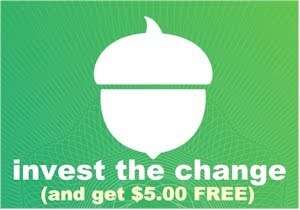 You'll get an instant 50 kickbucks just for signing up through my referral link. I <3 this app. Click on The Breakfast Project Facebook page, like them and then on the "Free Milk Offer" tab. Answer their question to print your coupon for a free gallon of milk when you purchase three breakfast items. Designer Living's Deal of the Day for today is an Avenue 8 Metro 12 PC bedding ensemble for just $49.99 This chocolate jacquard California King-size set includes: 200 thread count comforter, 2 standard shams, bedskirt, 2 Euro shams, fitted sheet, flat sheet, 1 standard pillow, 1 square pillow, 1 rectangular pillow. This set usually goes for $159.99. It's also available in more sizes (same price) in a navy jacquard here. The navy actually looks more like a silver to me, but ok.
At fifty bucks, either one of these is a steal, and will sell out very quickly. Limit 2 per customer. Free shipping at Designer Living starts at $75, so if you are just buying one of this set, the flat rate is $7.95, or $57.94 shipped. And if you need any prescription drugs, please read my post on Saving Money on Prescription Drugs. Amazon has got the identical set for twice the price, $19.99. 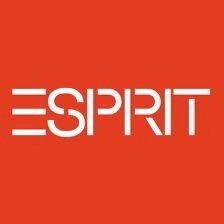 50% off entire store at Esprit! Get 50% off the entire store at Esprit when you enter promo code FEBSALE4 at checkout. This promo code is good on EVERYTHING through 2/28/12. Free shipping starts at a minimum purchase of $30. Spend less than $30 and shipping is $4.95. 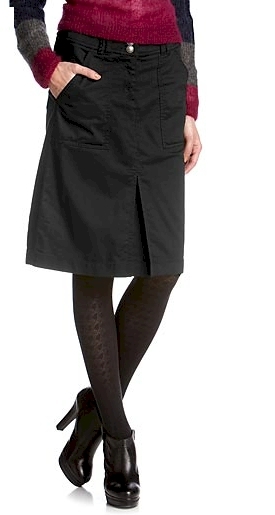 This stretch flare cotton skirt, pictured above, was only $17.50 after I entered the promo code. These houndstooth tights (so cute!) are only $5.50 with the promo code. I can see that it's not going to be too difficult to reach that $30 free shipping minimum. Let me know what you get through the sale! Johnson & Johnson has launched a new website chock-full of coupons for their product lines, i.e. Splenda, Listerine, Aveeno, Band Aids, etc. 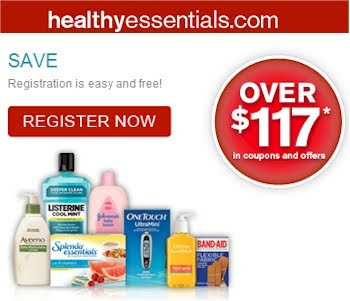 Sign up for Healthy Essentials here. The $1 Naked Juice coupon is back!